The “celebrity priest.” That’s a term that’s been used quite often in recent years in both secular and religious publications. And, most of the time, it has not been used in a complimentary way. 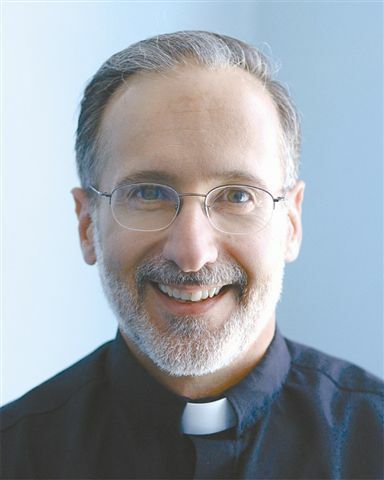 For example, the National Catholic Register ran an article just a couple of weeks ago that had the ominous title, “Beware of the Celebrity Priesthood.” Similarly, back in 2009, the New York Times had an online piece entitled, “Celebrity Priest Torn Between Church and Girlfriend.” It was about a well-known priest from Florida named Alberto Cutie. I’m sure some of you remember this story. At the time, Fr. Cutie had his own talk show on radio and television, and was a successful author. He wrote a best-selling book, as well as a column for several Spanish language newspapers in the United States and Latin America. Needless to say, he was a very popular and well-liked priest. People in the secular media referred to him as “Father Oprah”—because he was such a good interviewer. Well, unfortunately, Fr. Cutie was also having an affair with a divorced woman when this New York Times article appeared. He has since left the Catholic Church, civilly married the woman, and become an Episcopalian minister. Priests are called to be counter-cultural, because the Gospel of Jesus Christ is always counter-cultural. We’re called to be counter-cultural in what we preach and teach—and also in the way we live. And this is precisely why so many priests who become celebrities get into trouble. You see, it’s very hard to be counter-cultural when the culture is patting you on the back and telling you how great you are! And that applies as much to the “Church culture” as it does to the wider secular culture. Just think of someone like Fr. John Corapi. People in the secular culture detested him because he preached the full Gospel message without compromise—but faithful Catholics in the “Church culture” loved him. They thought he was great. 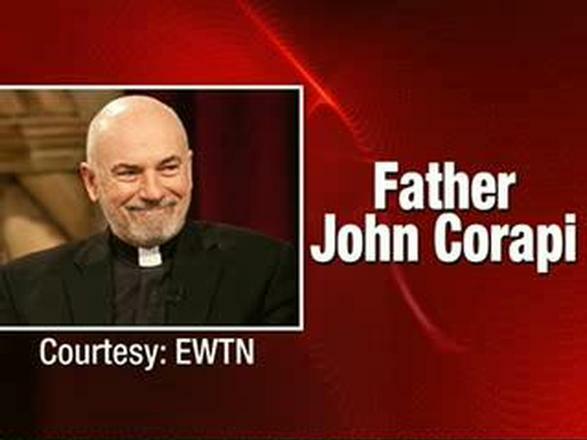 They watched him on EWTN every week; they bought his books and CDs. To them he was a kind of cult-hero. Well apparently somewhere along the line it all went to his head, so to speak. As many of us know, this man who used to preach obedience to everyone else has been defiantly disobedient to his religious superiors in recent months. There have also been credible accusations made against him of immoral activities with prostitutes, illegal drug abuse and financial improprieties. Speaking of financial improprieties, Fr. Frank Pavone, another popular priest who was on EWTN quite often, is also being investigated for possibly mismanaging funds that people donated to Priests for Life, the excellent pro-life organization that he used to be the head of. Hopefully, he will eventually be exonerated from any wrongdoing. But for every Pope John Paul II, Bishop Sheen, Fr. Groeschel, and Fr. Scanlan, there are 10 Fr. Corapis. That’s the sad reality. Which really shouldn’t surprise us, because priests are weak and fallible human beings who are subject to the very same temptations that the rest of the human race is subject to. You’ve heard that excuse before, I’m sure. Hopefully, you’ve never actually used it, but you’ve no doubt heard it. Well, the simple answer to that question is this: We should make the effort to be faithful to God even when others have failed, because Jesus Christ tells us that we should! Jesus taught that we must obey God and those whom God has appointed to positions of authority over us, even when those leaders disobey God themselves! According to Jesus, their disobedience must never be used as an excuse for our disobedience. But, as we also heard, they didn’t practice what they preached! Their celebrity status, in effect, went to their heads, and many of them lived lives that were filled with selfish pride. And yet, what did Jesus tell his disciples and the others who were present that day? Did he give them permission to disobey these men? Did he say, “From now on, you can completely disregard what these evil scribes and Pharisees tell you; you can tune them out completely. They don’t obey God and Moses in their lives, so you don’t have to obey God and Moses in your lives”? Do and observe all things whatsoever they tell you. As long as what they were teaching was in accord with the law of God and Moses, the people were obliged to be obedient. The disobedience of their teachers was not a valid excuse for their disobedience. Parents, that kind of lame excuse wouldn’t fly in your home, would it? You would never allow your disobedience many years ago to be used as an excuse for your children’s disobedience now! Nor should you allow it! It’s sad when great preachers and teachers of the Faith like Fr. John Corapi fall from grace. It’s tragic and it’s scandalous. But his fall does not negate the truth that he taught with such incredible clarity and conviction when he was a priest in good standing. The truth he taught is still the truth that will set us free, if we believe it—and live it! There were unfaithful Old Testament priests before the time of Jesus. We heard God’s tough message to some of them in today’s first reading from the book of the prophet Malachi. There were unfaithful religious leaders at the time of Jesus, as we heard in today’s gospel; and there have been unfaithful leaders ever since then, as we know from watching the evening news. Thankfully, most priests today are faithful—well over 90% of them. They do the work the Lord calls them to do quietly and without any fanfare or publicity. They’re not celebrities—and believe me they’re quite happy about that. They can relate to the words of St. Paul in today’s second reading from 1 Thessalonians 2, where he talks about working tirelessly night and day to proclaim the gospel of God. Pray for these good priests: pray for them to remain faithful always. And pray for the conversion of the others, especially those like Fr. John Corapi, who have allowed the trappings of celebrity to tarnish and to undermine their true vocations. To Love Yourself is to Desire to Become the Best Possible Version of Yourself. Self-love is not a bad thing. At least, the Christian version of self-love isn’t a bad thing. It can’t be, because Jesus explicitly tells us in Scripture—in this gospel passage we just heard from Matthew 22—that we are to love other people as we love ourselves. So obviously we won’t be able to love others properly—that is to say, in the way that Jesus wants us to—unless we first love ourselves in the way that Jesus wants us to! A healthy self-love is a prerequisite, a precondition, for a healthy love of neighbor. That’s not Fr. Ray’s idea; it’s Jesus’ idea. Which means that we’d better take it seriously! Now when most people think of loving themselves they probably think of the worldly version of the phenomenon—which is why they think it’s incompatible with Christianity. The worldly version of self-love includes things like selfishness, self-centeredness, arrogance and pride—all of which ARE incompatible with being a true disciple of Jesus. 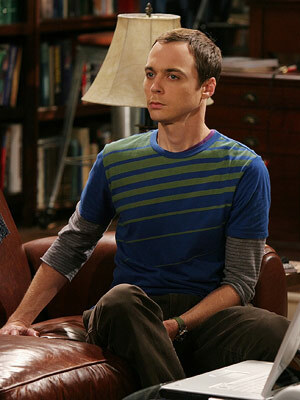 Are you familiar with the character, Sheldon Cooper, on that show The Big Bang Theory? Because he’s a genius, Sheldon thinks that he’s better than everyone else—a ‘more highly evolved’ human being, as he likes to put it. He’s a great example of someone who’s filled with the worldly version of self-love. Now that makes for some good television comedy—but it’s awful when you have to deal with somebody like Sheldon in real life! So what is true, Christian self-love? What exactly does it involve? Well, to use an expression that you find quite often in Matthew Kelly’s books, to love yourself means to have the desire to become the best possible version of yourself. That’s the ultimate goal of true, Christian self-love. Now let’s be clear about it, the best possible versions of you and me do not include sin—any sin at all! That’s a crucial point that needs to be mentioned here—which means that selfish, self-centered, arrogant, prideful people like Sheldon Cooper really don’t love themselves! They’re “full of themselves,” so to speak, but they do not have true, Christian self-love. Neither do people, for example, who live with their intended spouses before marriage! I think of this whenever I meet with an engaged couple that’s living together and sexually active (which happens quite often, unfortunately!). I’m sure they don’t realize it, but they really don’t love themselves (if they did they wouldn’t endanger their own salvation by having relations outside of marriage); nor do they really love the person they intend to marry (if they did, they’d never put that person’s salvation in jeopardy either!). But it does illustrate Jesus’ point, does it not? He links love of self with love of neighbor, implying that the quality of our self-love will directly influence the quality of our love for other people. Let me conclude my homily today by sharing with you a little reflection that’s often attributed to Blessed Mother Teresa, although in my research I discovered that it was actually written by a man named Kent Keith. But Mother Teresa obviously approved of it, because she allowed it to be hung on a wall in her home for children in Calcutta. Someone sent me this reflection a couple of months ago. On the surface, it might not seem to be about Christian self-love, but I assure you it is. I’ll talk about the connection after I read it. So what’s the connection between this reflection and the idea of loving yourself in the true, Christian sense? Simple. The reflection, first of all, talks about forgiveness. To be the best version of yourself (which, as I said earlier, is the goal of truly loving yourself), you must forgive others. The reflection talks about kindness. To be the best version of yourself, you must be kind. The reflection talks about success. I’m sure Mother Teresa would say that this is not about being successful in the eyes of the world. Rather, it’s about being successful in the eyes of God—which is simply another way of talking about being the best possible version of yourself. The reflection talks about honesty. Obviously you can’t be the best possible version of yourself if you’re deceitful. The reflection talks about being creative—in the sense of using the gifts God has given you for the building up of his kingdom here on earth. Being creative in this way is definitely part of what it means to be the best possible version of yourself. The serenity and happiness mentioned here come from being right with God and neighbor. That’s what Mother Teresa would certainly say. Once again, these are qualities of those who are sincerely striving to be the best versions of themselves. And, finally, the reflection speaks about doing good and giving your very best. Here again we encounter the connection between loving ourselves properly and loving our brothers and sisters. Those who are striving to be the best versions of themselves don’t focus on themselves (as ironic as that might sound! ); rather, they focus on the needs of their brothers and sisters. They do good and give their best effort—in loving service. To love yourself is to desire to become the best possible version of yourself. That’s the line to remember. Or, to put it another way, to love yourself is to have the desire to become a saint! Since Blessed Mother Teresa liked this reflection I just shared, I think it’s fitting that I end my homily today by seeking her intercession for all of us: Blessed Mother Teresa, from your exalted place in God’s heavenly kingdom, pray for us. Pray for us today and every day. Pray that we will have this kind of self-love (and not the worldly version) in our hearts always, so that we will be able to love our brothers and sisters in the way that Jesus wants us to love them, in the way that you loved others during your time on this earth; because, as Jesus indicated in today’s gospel reading, we will only be able to love our brothers and sisters properly if we first love ourselves properly. Amen. Between August 6th and August 10th of this year, there was widespread rioting, looting and arson in several cities in England. Most of us saw the frightening footage on the cable news stations: the people engaged in this activity were completely out of control. They indiscriminately destroyed the private property of others, and caused good, law-abiding citizens to fear for their safety and their lives. The world was shocked—although, according to the Prime Minster of England, David Cameron, the world—and that includes the people of Great Britain—should not have been shocked! They should not have been at all surprised. [He began by saying] It is time for our country to take stock. Last week we saw some of the most sickening acts on our streets. . . .
[Then, a few lines later, he got down to the ‘nitty-gritty’:] So as we begin the necessary processes of inquiry, investigation, listening and learning: let's be clear. [After giving some reasons why this is the case, he added] In this risk-free ground of moral neutrality there are no bad choices, just different lifestyles. 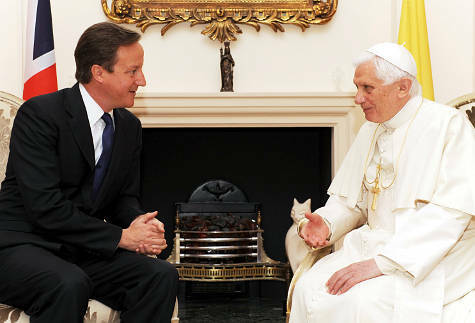 God bless Prime Minister David Cameron, for making it clear to his people that we are all human beings with free will, who have the power to make moral decisions which have definite consequences—consequences for us as individuals, as well as consequences for our families and for the society in which we live. It’s a message that people in England and the entire western world need to hear more often. And, of course, as Catholic Christians we would add that our personal moral decisions also have eternal repercussions: What we do here on earth will ultimately determine who we are and what we are and where we are for all eternity! The king wants them there for his son’s wedding (in other words, God wants all people to be saved)—in fact he goes so far as to send messengers to personally extend the invitation (the messengers symbolize the prophets in Old Testament times and the representatives of the Church in New Testament times: the Pope; the bishops in union with him, etc.). Unfortunately, many who get the invitation make the personal decision either to ignore it or to attack the messengers (that, of course, still goes on today with respect to those who constantly attack the Church and her teaching). But it’s not enough to decide that you want to go to the eternal wedding feast of the king’s son, Jesus; you also have to make the decision to dress properly for the occasion by putting on a ‘wedding garment’. In modern Catholic terms, that garment is a symbol for being in the state of grace. It’s a sign of the fact that the moral choices a person made during his or her life were the right ones, preserving baptismal innocence; or, if they were the wrong ones, it implies that the person repented of those sins and was absolved of them before death. Those in this last category are like the ‘bad’ people in the parable who got invited at the end. They changed and put on wedding garments before they arrived at the celebration—with the exception of that one, bad dude who thought he could get in without changing his dirty, sin-stained clothes. That, as we heard a few moments ago, didn’t cut it with the king. He was not impressed! I think Prime Minister Cameron would like this parable, because it contains a message about personal responsibility and accountability—a message that far too many people in his country (and ours!) have tried to ignore for several decades. Just as people last week wanted criminals robustly confronted on our streets, so they want to see these social problems taken on and defeated. So, do we have the determination to confront all this and turn it around? Of course, it’s a mistake to think that government alone can change these things, Mr. Prime Minister. Hopefully you realize that. The change must begin with us—with each of us, individually, examining our lives, converting our hearts, and changing for the better—every day! Do the people of England have the determination to do that? I pray they do. And on this Columbus Day weekend I pray that we in the United States do as well. Well, let me offer you an alternative interpretation this morning. Rather than being filled with pride, I would say that Paul was filled with what might be called ‘a saintly self-confidence’. He knew he was a sinner like everyone else—in fact, in his first letter to Timothy he called himself “the worst of sinners”—but by the time he wrote this letter to the Philippians he had been forgiven for the major sins in his life and had completely turned away from them. And he was so confident in the way he was currently living that he knew he could, in good conscience, be a true role model for the Christians at Philippi. He didn’t have any deep, dark secrets; he didn’t have any skeletons in his closet (so to speak); he didn’t have to worry about causing scandal among the faithful. He was continually and consistently ‘fighting the good fight and running the race and keeping the faith,’ so he had no qualms whatsoever about encouraging the people of Philippi to imitate him. Obviously our world today needs more Christians like St. Paul, especially, I dare say, more MALE Christians like him—since men are called to exercise many roles of leadership, especially as fathers! I had this thought after I read an email last Friday from one of the female adults who attends our Thursday night youth group. The previous evening she had been present when I had the teens read an article about a man named Philip Rivers. 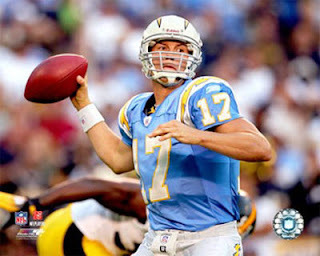 Now for those of you who are not followers of the NFL, Philip Rivers is the star quarterback of the San Diego Chargers football team. He’s also a very committed Catholic. Earlier this year he was the guest speaker at a Catholic men’s conference in Phoenix, Arizona, where he did an interview with a representative of the Life Teen organization. Let me share with you now a few excerpts from the Rivers interview. These are some of the responses that had them ‘goo-ing’ and ‘gaa-ing’ (I’m not sure those are real words, by the way, but they were in her email, so I’ll use them to make the point). Wouldn’t it be nice if more Catholic parents had that philosophy—especially Catholic parents here in Westerly whose children participate in weekend sporting activities? I should also add that I was pleasantly surprised to see that, when he talked about his family life, Rivers explicitly mentioned NFP (Natural Family Planning), and the positive impact that has had on his relationship with his wife. No artificial contraception for Mr. and Mrs. Philip Rivers. He really IS a serious Catholic! In fact, based on all that he said in this interview, it seems that Philip Rivers is even more serious about his faith than he is about football (which is saying a lot, because he’s an extremely intense player—one of the most intense in the entire National Football League!). I ask you to join me today in praying for him that he will remain a committed Catholic throughout his life—because it’s not a given! He could give in to one of those temptations he talked about and turn away from God in an instant, if he chose to. He has free will just like the rest of us! Let’s pray that he’ll be able to say those words as Paul did—with saintly self-confidence. And, while we’re at it, let’s also pray for ourselves and for one another during this Mass, that we’ll be able to do the very same thing.